>Noro, Toys for Tots & More! 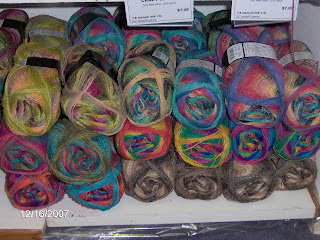 450 yards of Noro’s Kureyon in sock weight for only $19.50/skein! Need I say more…6 colors in now and 6 more colors en route to the shop before year’s end! Toys for Tots Drive ends this Wednesday, December 19th. Bring in a toy with your proof of purchase receipt and we will say thank you by rewarding you with the 3 K Club points for your donation (up to 50 points)! Thank you to all who have participated to date!! The Winter Class Projects are on display in the front of the shop. Be sure and sign up for your first choices before the classes fill up! Check the class schedule on the web site for all the details or just give us a call! And, the Simply Shetland Double Knitting yarn came in today in 20 colors and we have a fresh supply of LambswoolCashmere & Opal sock yarn too! Next > >New Books in the Shop!